YARDLEY, PA, November 29, 2018 /24-7PressRelease/ — Grey Nun Academy recently kicked off its yearlong celebration to mark 55 years of excellence in education with a liturgy and in-school celebration for the Sisters, students, parents, faculty, and staff. The celebration also featured the GNA Day of Giving and welcomed many additional Grey Nuns of the Sacred Heart back to campus for the festivities. The Academy will continue to commemorate its emerald anniversary with special events throughout the remainder of the school year, including its annual Gala in the spring of 2019. Sponsored by the Grey Nuns of the Sacred Heart and located on the grounds of the former Motherhouse in Yardley, PA, Grey Nun Academy has a rich history and heritage dating back to 1963. Beginning with nine kindergarten students housed in the original Manor House on the Dietz estate in October of 1963, the original school was called D’Youville Manor Academy in honor of its community foundress, Marguerite d’Youville. As the Sisters became established and well known in the local community, and the Academy began to grow, the school name was changed to Grey Nun Academy. Strong Board and Administrative leadership continued to support the mission of the Academy, and by 1968, a Home and School Association was initiated to allow parents to play an active and integral role, which continues today. By summer 1972, the adjacent Sacred Heart Junior College was closed and remodeled. The Academy’s lower school then took up residence in the former junior college building. Subsequent building projects have provided a multipurpose gymnasium, the McKenna Center, and Moyle Gallery. The Academy continues to be recognized for its excellence in the community, most notably named a prestigious National Blue Ribbon School of Excellence in 2009. 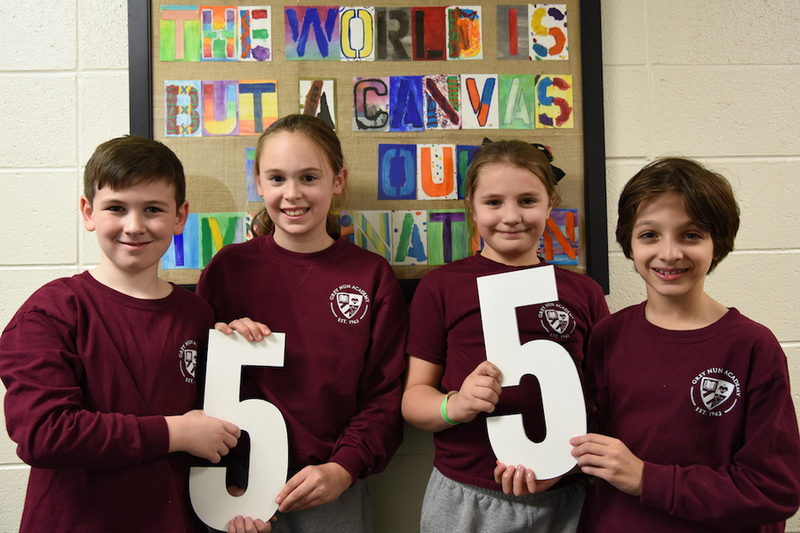 The Academy was also named a finalist three years in a row (2015-2017) in the Bucks Happening popular people’s choice competition, won “Best Private School” in the 2017 Bucks County Courier Times “Best Of” contest, and was again a 2018 Finalist for “Best Private School” in the Bucks County Courier Times. The Grey Nuns of the Sacred Heart are a congregation of women religious, rooted in the charism of St. Marguerite d’Youville, the first native Canadian saint. The Grey Nuns of the Sacred Heart strive to create a compassionate world through prayer, ministry and advocacy. For more information, visit www.greynun.org or call 215-968-4236. Founded in 1963 by the Grey Nuns of the Sacred Heart, Grey Nun Academy is an independent, Catholic, coeducational, Lower (PreK-5) and Middle school (6-8) in Bucks County, Pennsylvania. The Academy’s mission is to offer an academically rich curriculum that meets the unique needs of individual students while respecting the rights, interests, and dignity of each child. Grey Nun Academy is a member of the National Association of Independent Schools (NAIS) and dually accredited by Middle States Association and AdvancED. The Academy welcomes children of all faiths and cultures. The school’s educational process leads children to embrace and promote peace and social justice in our world. To learn more, please visit: www.greynunacademy.org or call 215-968-4151.